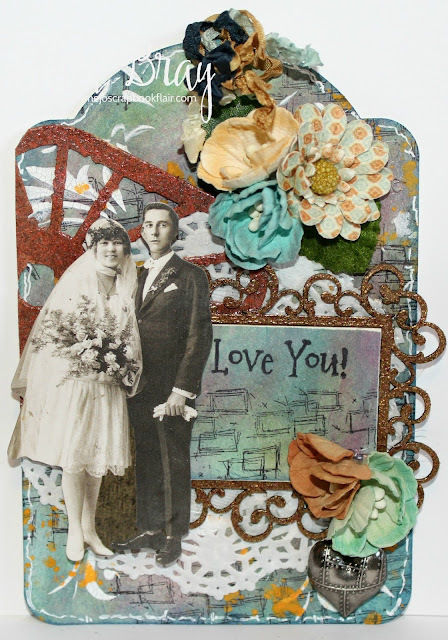 Apply Colorbox Blends to one of GRAPHIC 45 WHITE TAGS!!! 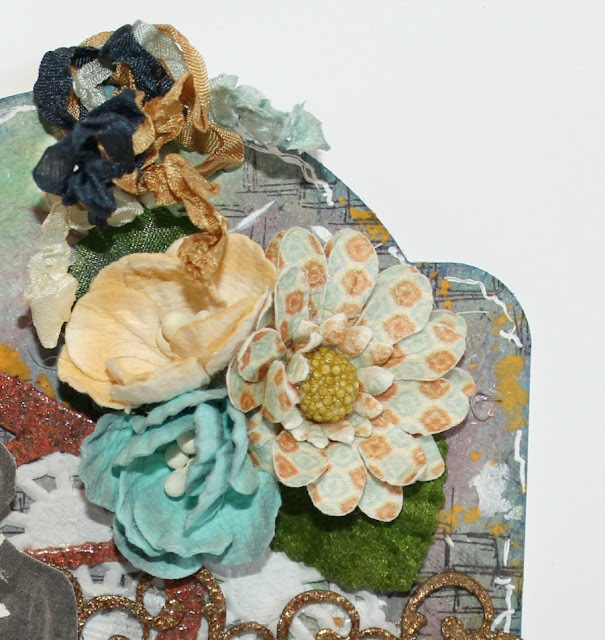 Lay a TIM HOLTZ STENCIL FROM STAMPERS ANONYMOUS to top and apply WENDI VECCHI CRACKLE PASTE to top with palette knife; dry. Apply Colorbox blends over the top of second stencil. Stamp background with BLANK PAGE MUSE Grunge Background Stamps. Add line work with white pen. Emboss a frame from GYSPY SOUL LASERCUTS using EMERALD CREEK SUPPLIES/SETH APTER BAKED TEXTURE! Die cut SETH APTER Ray of Sunshine from cardstock. Emboss with EMERALD CREEK SUPPLIES BAKED TEXTURE! Using XYRON CREATIVE STATION; apply adhesive to embossed pieces and doily. Place doily to top of prepared tag. Add embossed ray of sunshine to tag. Place the embossed frame and stamped "Love You" to tag. Add a paper doll image to tag with pop dots. Tie MAY ARTS RIBBON to top of tag along with a few flowers. 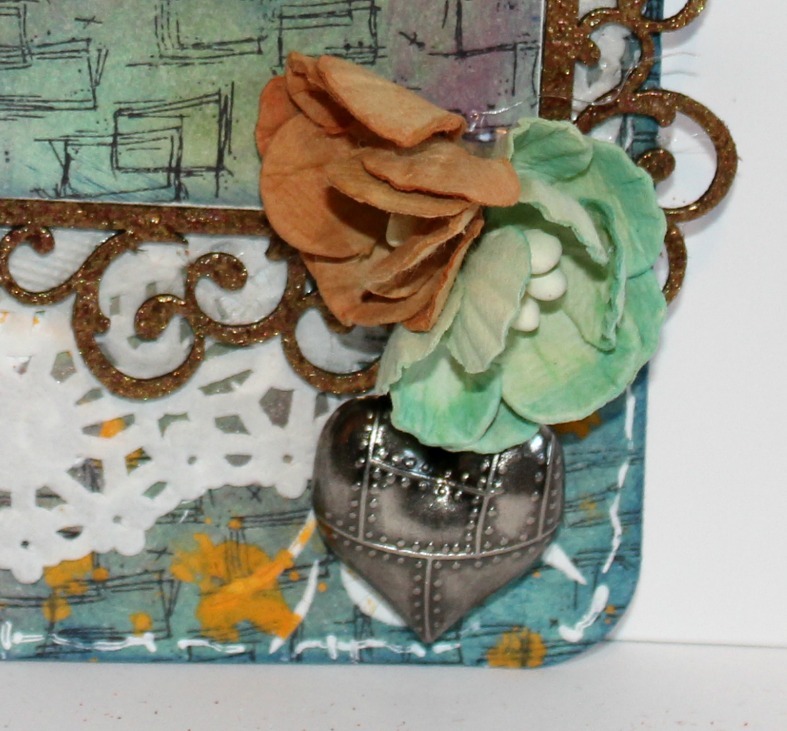 To finish add a few more flowers to the bottom of tag along with a PRIMA/FINNABAIR heart. I hope you are inspired to check out SOME OF MY FAVORITE PRODUCTS that I have highlighted! Love how this came together Pam! Fabulous embossing.